Long story short: digital strategy is capable of either boosting your enterprise to a brand new level or burning it down to the ground. That depends on the implementation methods. But to be able to look through the curtains and grasp the context of the digital strategy 2018 mentioned above, we must break the whole thing down into simple, easy to understand bits. It is the new era of doing business that has little in common with our natural understanding of the term "digital". The digital strategy often has little to do with social networks, shares, follower base, and other related terminology. Digital transformation is about the pace of an enterprise adapting to the rapidly-growing technology, evolving types of corporate culture and optimized ways to interact with the customers. It allows enhancing the customer experience, getting better revenue and improving the organization as a whole. Uber’s digital transformation study is worth examining. The company became a global taxi enterprise by allowing people to get from point A to point B with a few taps on the smartphone. No reason to make calls, wait or even use cash - everything went mobile with a responsive feedback system that boosts competition and revenue for the company and its employees. Other success stories are Amazon, Netflix, Rockwell, Disney... - pick your favorite. Let’s try to dive into the matter a bit more and determine the key indicators that define the importance of the strategy and the process of transformation. Why Is Digital Transformation Crucial For Modern Business? Here are some essential points of significance that make digital strategy and its execution a powerful tool for businesses regardless of their size. Contextual, internal and external evolution. The technology makes business evolve in multiple ways: strategy, the culture within the organization, communication with the clients and so on. Keeping up with the competition. According to Gartner, 80% of senior executives have digital transformation underway. Going digital becomes a means of survival for legacy businesses before the digital enterprises take their place. Providing more value. Digital transformation allows implementing new ways to offer value for the customers, to appreciate the talent within the organization more and to increase ROI for the company further. Enhancing competences. Companies get staffed with more versatile employees as well as managers learn to be more aware, reachable and communicative while both parties are equally interested in working for common interests. Proven results. Gartner’s 2017 survey has shown that 56% of CEOs state that going more digital has already increased their profits. Going "digital" has become a significant trend in the global business ecosystem. 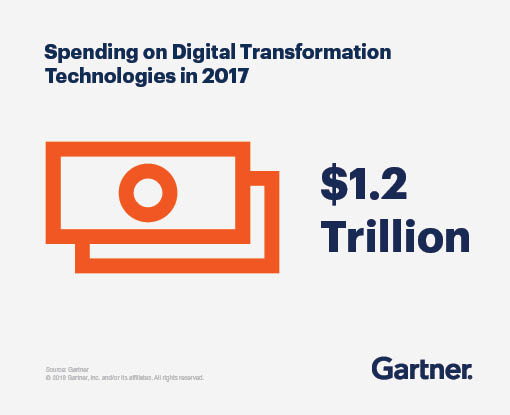 The number of investments towards that goal has increased drastically and reached $1.2 trillion, according to Gartner. Digital disruption is what causes significant shifts in the industry. When a competitor handles the transformation well and receives a better response from the clients, bigger revenue and makes employees happier, the disruption occurs. It forces the other players within the market niche to take steps for remaining competitive and surviving. The disruption in media occurred around 2005 when large industry giants had to either increase their online presence and focus on the digital aspect more or to remain paper or TV-exclusive and, most likely, cease operations after losing customers. Ability to notice digital disruption and to take measures is what makes an organization continue its growth and adapt to new challenges. What Does Digital Transformation Consist Of? As you might have already noticed, the transformation is a complex process that is made of multiple variables. These aspects touch every side of the business - from internal operations to the way customers receive end product. Here we will try to determine critical parts of the process while explaining their importance to the business of our time. Digital businesses learn to use the data to achieve more efficient results. Big data analysis allows the companies to make the most of the previously less important data: patterns of behavior, buying habits, comparison of the location and preferred services or wares, etc. Utilizing this vast resource can prove beneficial for a better understanding of the client base and offer better services than before. By learning more about the clients, companies can adjust the regular service chain to suit the individual needs of each customer and automating the process. It enables to make a much more customized and unique experience for every client. A customer-based approach leads the whole digital organization. Within the structure, it then separates into multiple spheres: how well the managers know and use the strengths of their teams, how encouraged and valued each worker is, how comfortable is working environment for every member of the organization. Openness, transparency, and leadership take the place of segmentation and command. To remain competitive on the market, the enterprise must automate most of the internal processes. The new era of messengers can enhance cross-department communication, life-action meetings can be held regardless of the location of each participant, etc.. Digital companies reduce the time and effort required to carry the projects from concept to release/delivery phase. Having the technology is only a small part. Knowing how to use it for better ROI and smoother business processes is a huge part of it. But putting effort towards improving on existing tech and finding new solutions to issues defines the process of transformation. These components are just a part of an extensive and lengthy process that does not have a definite end. Every aspect performs a particular function that would mean little if other areas are not pursued. For example, if an enterprise invests in adopting the technology by does not pay attention to the organizational culture, all progress will slow down, if not stop altogether. 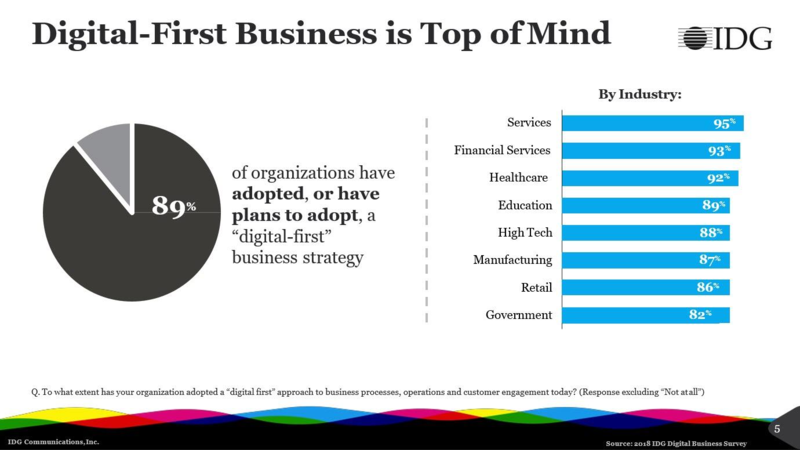 According to IDG’s white paper on 2018 State of Digital Business Transformation, 9/10 organizations either plan to adopt or have already chosen a strategy with the digital-first approach. The digital strategy allows combining all factors that need innovation into one piece that benefits the organization. Employees must have proper leadership to embrace new technologies and adapt to more efficient, customer-centric culture. R&D won't succeed much in further innovation without a vision brought by digital strategy. Top-management won't become more accessible by lower-end staff without guidance and realizing that such approach is the company's new reality. A digital strategy consulting that takes into account all nuances and has a roadmap for progress comparison will succeed. But there are still business owners and executives that may not fully understand the importance of the shift and the scale that it requires. The whole process is somewhat challenging. Since the concept is relatively new on the global scale, there are many assumptions and opinions that disrupt the understanding of digital strategy and efforts required to implement it. We have gathered some of the most common misconceptions that stand in the way of succeeding on the digitization path. Digital transformation is nothing like the collective project that goes from an idea to the end product. It is an ongoing process that requires effort and financial investments. Being "digital" as an organization means searching new ways to optimize business models, provide even better customer experience and potentially also exploring brand new business vectors. If the efforts are reduced, some areas like culture, customer experience or R&D can stagnate and possibly postpone the general positive changes within the company. Which may have a direct effect on the customer base and revenues. The examples of companies ceasing their operations after the cases of digital disruption make it clear: failure to adapt to changing needs of customers will backfire in the nearest future. Kodak, Toys R Us, Nokia, Atari, Motorola: all were once gigantic and thriving, yet failure to innovate had them replaced by better software solutions that suited customer’s needs.